Today the Supreme Court clarified two small but significant copyright issues, relying on the express words of the copyright statute in one, but deviating slightly in the other. In Fourth Estate Public Benefit Corp. v. Wall-Street.com, LLC, [17–571] the Supreme Court held that §411 explicitly requires that a plaintiff actually have a copyright registration before bringing a copyright suit. However, in Rimini Street, Inc., v. Oracle USA, Inc., [17–1625] the Supreme Court held that the term the term “full costs” in §505 of the Copyright Act simply means the “costs” specified in the general costs statute codified at 28 U.S.C. §§1821 and 1920, and does not include a party’s other costs, in effect giving no weight to “full” in the statute. In Fourth Estate Public Benefit Corp. v. Wall-Street.com, LLC, Fourth Estate sued for infringement of its news articles from Wall-Street’s failed to remove them from its website after canceling the parties’ license agreement. Fourth Estate had filed applications to register the articles with the Copyright Office, but the Register of Copyrights had not acted on those applications. The District Court dismissed the complaint because 17 U. S. C. §411(a) provides that “no civil action for infringement of the copyright in any United States work shall be instituted until . . . registration of the copyright claim has been made in accordance with this title.” The Eleventh Circuit affirmed, holding that registration has not been made under §411(a) until the Copyright Office actually registers the copyright. The Supreme Court affirmed, agreeing that registration occurs, and a copyright claimant may commence an infringement suit, when the Copyright Office registers the copyright. This resolves a split in the circuits, as the Fifth, Seventh, and Ninth Circuits and a smattering of district courts held that merely filing a complete application was sufficient, while the Tenth and Eleventh Circuits, and other district courts maintained that “registration” in 17 USC §411 meant actual registration. Todays decision also does not leave copyright owners in too difficult position. The Copyright Office has a process for expedited copyright registration (https://www.copyright.gov/help/faq/faq-special.html), and the Supreme Court reiterated that the copyright owner can still recover pre-registration damages. At most this ruling should slow a copyright plaintiff a week or two, and cost a few hundred dollars more – barely a blip for a plaintiff heading off to federal court to enforce its rights. In Rimini Street, Inc., v. Oracle USA, Inc., after a jury awarded Oracle damages for copyright infringement, the district court added Oracle’s fees and costs, including $12.8 million for litigation expenses such as expert witnesses, e-discovery, and jury consulting. The Ninth Circuit affirmed the award, acknowledging that it covered expenses beyond the six categories of costs enumerated in general federal statutes authorizing district courts to award costs (28 U. S. C. §§1821 and 1920). The Ninth Circuit explained that the additional award was appropriate because 17 U. S. C. §505 gives federal district courts discretion to award “full costs” to a party in copyright litigation. The Supreme Court reversed, holding that Sections 1821 and 1920 define what the term “costs” encompasses in subject-specific federal statutes such as §505. The Supreme Court said that while Congress may authorize awards of expenses beyond the six categories specified in the general costs statutes, the courts may not award litigation expenses that are not specified in §§1821 and 1920 absent explicit authority. The Court said that its precedents have consistently adhered to that approach, and the Court rejected Oracles arguments that this ignored Congress’s use of “full” to modify costs in §505. Photographer Douglas Kirkland has sued the Kfir Moyal Art Gallery Inc., in the Southern District of Florida (1:19-cv-20293-DPG), alleging that the Gallery copied and distributed Kirkland’ copyrighted Work for purposes of advertising and promoting Kfir Moyal’s business, and in the course and scope of advertising and selling products and services. The courts have been accommodative of artists who use preexisting images in their work, as long as the use is “transformative.” The question is whether Kfir Moyal’s image on the left is in fact transformative of Kirkland’s 1965 photo of Brigitte Bardot on the right. Is the image on the left transformative of Kirkland’v 1965 photo of Brigitte Bardot? Kirkland’s lawyers are cleverly focus the Complaint not on the artistry of the Kfir Moyal’s image, but on its commercial use in advertising and promotion, hoping to avoid favorable treatment many courts give purely artistic works. It remains to be seen if this strategy is successful. Advertising, press releases, and even product packaging all communicate the company’s value proposition to the consuming public, but occasionally they can do more harm than good. These items are a direct reflection on the company and its products and services, and need to be carefully vetted. This is more than just careful proofreading, but fully vetting the content to reduce the risk of embarrassment and even legal problems. Did we create or obtain the right to use all of the text? Did we create or obtain the right to use all of the images? Do we have written permission to use the third party material, or has a Company lawyer concluded that the use is appropriate? List each person identified, mentioned, or depicted. Do we have written permission/release to identify, mention, or depict this person? Does it appear that any person or entity is providing a testimonial or expressly or impliedly endorsing our products or services? Do we have written permission/release to present this testimonial/endorsement? Is the testimonial/endorsement accurate and fair? If the testimonial/endorsement paid, is that fact disclosed? Is there any reason to believe that the person identified, mentioned, or depicted could be controversial or divisive, or otherwise impair our image or that of our products and services? Are claims regarding “free” (i.e., no-cost) accurate? Are there any claims regarding safety? Are any claims regarding improved truthful? Have claims of improvement been vetted with legal (e.g. subsequent repair)? Are claims regarding place of manufacture (e.g. “made in USA”) accurate? If there are specific claims about our products or services (e.g. rankings or numerical data), are they accurate, provable, and documented? If there are comparisons with third party products, are they accurate, provable, and documented? If there are references to third parties or third party products, do we have express/implied permission, or are they otherwise legally justifiable? Are all such references accurate, provable, and documented? Are all such references not disparaging? List all existing marks used. Are our existing trademarks used correctly? Presented correctly (in compliance with existing usage guidelines) and consistently? Identified with a TM, SM, or ®? Have our new marks been cleared? Have we applied to register our new marks? Are our new trademarks used correctly? Copyright Generally, press releases do not bear copyright notice as copying is to be encouraged. However, packaging and advertising can and should be copyrighted. Are any of our trade secrets or confidential information mentioned? Are any third party trade secrets or confidential information mentioned? Are any of our inventions mentioned? Has a patent application been filed? Should the invention be mentioned/disclosed at this time? Are any third party inventions mentioned? List all third-party marks used. Are all third party trademarks use truthfully? Are the third party trademarks used correctly? Do we identify correct owner of mark or at least disclaim we are the owner of the mark? Do we describe our products or services in a way that might indicate they are covered by a third party patent? Do we make any claim about our product or service that might indicate they are covered by a third party patent? Do we have written permission to use third party works (text, images)? Do we use correct copyright notice? Are we disclosing any third party confidential information? Do we have written permission to do so? Are any disclaimers or explanations needed? For example, related to: third party uses, claims or statements made about the product, guarantees or warranties made, depictions of the product or service. Revisit your employee agreement to ensure that the Company’s IP is adequately protected. Update your invention disclosure form. Even though we are operating in a first to file system, record keeping is still important to be able to prove/disprove derivation. Make sure that your forms are up to date. Track agreements more closely. Do you know when the confidentiality and license agreements you have entered expire? Do you a process to ensure performance of these agreements? Evaluate inventions disclosures more critically. Not all inventions need protection — for example inventions that solve problems unique to your product are unlikely to be infringed by third parties. Take copyright seriously. Copyright provides wide ranging protection for advertising, packaging, websites, and other works of authorship. These rights are enhanced by the application of proper copyright notice, and prompt registration of the works. Make employee education a priority. Your employees are critical to protecting your intellectual property, and avoiding the intellectual property of others. Create a brand guide. Establish clear rules for the proper presentation and use of your trademarks. Publish these rules so that everyone inside the company, and outside the company uses your marks correctly. Create a social media policy. There are a surprising number of ways things can go wrong on social media, and some simple rules can prevent this from happening. E-mail better. Make sure your emails don’t put you and your activities in an unfairly light if they are viewed by outsiders. This is a great time of year to revisit your employee agreements and update them if necessary. Changes to employee agreements generally must be supported by consideration, and end of year bonuses, salary adjustments, and promotions provide consideration to allow the employer to amend the agreement with existing employees. □ Authorization of company to file patent applications and execute documents if employee is unable or unwilling to do so. Will Netflix have a Devil of Time Defending Suit Brought by Satanic Temple? 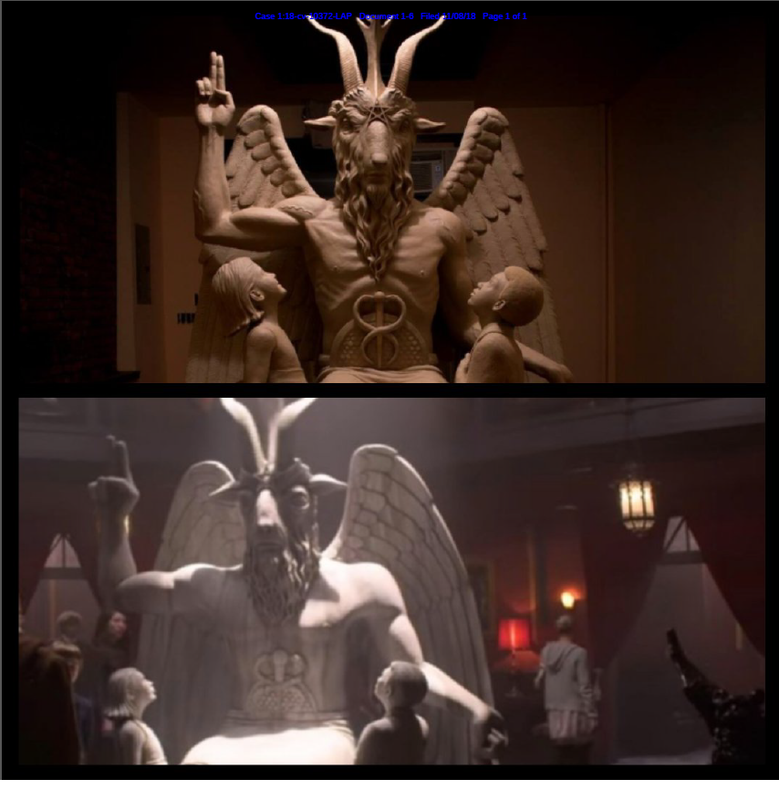 The Satanic Temple sued Netflix, for using a computer-generated image of Baphomet in the Chilling Adventures of Sabrina, that was allegedly that was apparently copied directly from a statue created for The Satanic Temple by sculptor Mark Porter. While the images of Baphomet are similar, the similarities can be attributed to a drawing of Baphomet by a 19th-century French occultist named Eliphas Levi. However a distinctive detail added by Mark Porter are two adoring children, a feature in Netflix’s version as well. According to Rolling Stone, The Satanic Temple send a cease and desist letter, demanding action by November 9, 2018, but then jumped the gun and filed suit on the 8th. But then again, who really trusts Satan? A federal judge in New York awarded 21 graffiti artists a total of $6.7 million after a jury had found that a developer violated their VARA rights by destroying dozens of their murals at the 5Pointz complex when the owner demolished the buildings for redevelopment in 2014, yet property holder may still need schooling on the Visual Artists Rights Act, which gives artists rights that can interfere with the property owner’s right to use its land as it sees fee. The most recent lesson is being given by Kyle Holbrook, a artist is suing the City Pittsburgh, its housing authority, the Urban Redevelopment Authority, the Port Authority of Allegheny County and numerous landowners and developers over the destruction of his murals, often as part of redevelopment projects. The rights conferred by subsection (a) may not be transferred, but those rights may be waived if the author expressly agrees to such waiver in a written instrument signed by the author. Such instrument shall specifically identify the work, and uses of that work, to which the waiver applies, and the waiver shall apply only to the work and uses so identified. In the case of a joint work prepared by two or more authors, a waiver of rights under this paragraph made by one such author waives such rights for all such authors. Before allowing original art to be installed on one’s property, the property owner should consider obtaining such a waiver. Otherwise, future use and development of the property may be impaired. In Van Zant v. Cleopatra Records, Inc., [17‐2849](October 10, 2018), the Second Circuit reversed the judgment of the district court and vacated the injunction against defendants’ distribution of a film about Artimus Pyle’s experience as the drummer for Lynyrd Skynyrd, and the award of $632,110.91 in attorneys’ fees. 3. Each of the Individual Defendants . . . shall have the right to exploit his . . . own respective life story in any manner or medium, including . . . [a] motion picture . . . . In such connection, each of the foregoing shall have the right to refer to “Lynyrd Skynyrd” and related matters and to describe and portray his experience(s) with “Lynyrd Skynyrd;” provided that no such exploitation of life story rights is authorized which purports to be a history of the “Lynyrd Skynyrd” band, as opposed to the life story of the applicable individual. Survivors: The True Story of the Lynyrd Skynyrd Plane Crash,” and after a news article revealed that a film was in the works, plaintiff’s brought suit to enforce the consent order. The district court issued a permanent injunction prohibiting distribution of the Film and other related activities, reasoning that even though Cleopatra not a party to the consent order, it had acted “in concert or participation” with Pyle to produce the Film, which violated the Consent Order. the actions of an entity that was not a party to the contract. Ultimately the Second Circuit concluded that the injunction was unenforceable because it was insufficiently specific, permitting what it also appeared to prohibit. Pyle was permitted to make a movie that describes his experiences with Lynyrd Skynyrd and to refer to the band, but he may not make a movie that is a history of the band. The script for the movie that Cleopatra has been enjoined from distributing illustrated the inconsistency, or at least the insufficient specificity, of the terms of the Consent Order. The script tells the story of the plane crash in which some members of the band were killed and from which Pyle walked away. That crash is part of the “history” of the band, but it is also an “experience” of Pyle with the band, likely his most important experience. Provisions of a consent decree that both prohibit a movie about such a history and also permit a movie about such an experience are sufficiently inconsistent, or at least insufficiently specific, to support an injunction. Two judges joined the opinion, but wrote separately that in their view the movie script did not violate the Consent Order, further illustrating the point that the Consent order was insufficiently specific. Private agreements that restrain speech must be clear and unambiguous to be enforceable. While regulation is a necessary evil, ridiculous incidents such as this are important reminder that it is an evil. The Federal Circuit recently faced a patent marking issue in Arctic Cat Inc. v. Bombardier Recreational Products Inc., [2017-1475] (December 8, 2017). In that case, the patent owner Arctic Cat had previously licensed the patents in suit to Honda. The license agreement with Honda specifically stated that Honda “shall have no obligation or requirement to mark” its licensed products. While this provision no doubt made sense to Arctic Cat at the time, it put at risk the damage award against accused infringer Bombardier for the period of time before Arctic Cat received actual notice of infringement. The Federal Circuit held that an alleged infringer who challenges the patentee’s compliance with § 287 bears an initial burden of production to articulate the products it believes are unmarked “patented articles” subject to § 287. Once the alleged infringer meets its burden of production, however, the patentee bears the burden to prove the products identified do not practice the patented invention. Compliance with the patent marking statute can be difficult because the patent owner may have to change the molds or other equipment used in manufacture as the patent issues, and again as the patents expire or are invalidated (lest the patent owner be accused of false marking). This obligation also extends to the patent owner’s licensees, but it is easy to understand why a licensee, such as Honda in this case, would not want to be bothered with marking. However many patent owners appear to be unaware that the AIA made it easier for patent owners (and their licensees) to comply with the patent marking requirement. While it could not have helped Arctic Cat and its licensee Honda in their pre-AIA license, amended §287(a) now allows the patentee to mark by “fixing thereon the word “patent” or the abbreviation “pat.” together with an address of a posting on the Internet, accessible to the public without charge for accessing the address, that associates the patented article with the number of the patent.” Thus when patents issue or expire, a patent owner simply has to update a website – not change molds or printing plates. Virtual patent marking is one of the few benefits of the AIA, but inventors and their assignees do not appear to be taking advantage of it.